Wondering where to find work from home jobs? You’re not alone! This is one of the most popular questions beginners ask when they decide to kick their cubicle to the curb. Where you look for a remote job, depends on the type of employment you’re after. The two main types of at-home jobs you can find online include employee positions and freelance gigs. Before you ask where to find work from home jobs, figure out what type of employment you’re looking for. This will save you tons of time (and sanity). Plus, you’ll streamline your search, making it that much easier to go from thinking of working remotely to actually working remotely. First up, we’ll look at some of the best places to find work from home jobs for freelancers. As a quick refresher, when you work remotely as a freelancer, you are essentially your own boss. This means you are in charge of finding clients, getting work done, processing payments, and running the show. Being a freelancer comes with plenty of perks like a flexible schedule and ability to work on projects that interest you. This is the Mecca of freelance marketplace sites. As a freelancer here, you ‘bid’ on jobs posted by clients. Your bid includes a pitch, price, and information about why you’re the perfect fit. Keep in mind, you may be bidding against dozens of freelancers. And you won’t always get hired. But with a little practice, patience, and tenacity, you can find freelance success on Upwork. What I like about CloudPeeps is the community of freelancers you join. It’s not just about bidding on jobs or beating out the competition, it’s about building your own sustainable freelance business. There’s an application process you need to go through before being accepted on this platform, but it’s worth going through if you’re ready to enjoy the flexibility freelancing affords. Another freelance platform that does things a little differently is FreeeUp. You’ll go through an application process before being accepted into the community. And you’ll never have to bid on jobs like other freelance marketplaces. Instead, freelancers are paired with clients based on the client need and freelancer’s skill. You spend less time bidding and more time working. If you’re the type of freelancer who wonder less about where to find work from home jobs and more about how to get clients to come to you, Fiverr may be a good solution for you. You don’t bid on jobs. You don’t submit proposals. Here, you set up a freelance shop and have clients come to you. And while gigs start out at just $5, they can go as high as $500 with add-ons. If you think you can’t find freelance success on Fiverr, think again. There are power sellers on this site earning six-figures a year! Freelance writers, editors and proofreaders will want to bookmark the ProBlogger job board. Just about every day, new freelance positions are posted here. Yes, you have to submit an application with a perfectly crafted pitch, but these are often long-term or higher-paying gigs posted here. If you don’t have freelance writing experience, that’s okay. You can get started as a freelance writer from scratch. Think you’d make a great proofreader? You can do that as a beginner too. Here’s how. Fun fact: Total only hires the top 3% of freelancers around the world. But don’t let that scare you! If you have the skills but no prior freelancing experience, that’s okay. You should still apply to join their network of freelancers. Big-name clients on that site include J.P. Morgan, Pfizer, and Airbnb. Crossover recognizes that it can be tough to find recurring worker as a freelancer. That’s why they’ve set out to match freelancer with long-term contracts. There’s a rigorous application process to go through, but getting in here means stable work as a freelancer! Today, just about any office job can be done at home. Many companies recognize this and are either remote-friendly or are completely distributed. As a reminder, a distributed workforce is one where all (or most) employee work from a remote location. Needless to say, there are no shortages of places to find at-home employee positions which means you get all the benefits of an office job, without the daily commute. Indeed is the world’s largest job search engine. It scours the depths of the Internet to bring job leads conveniently to one location. Employers can also post their jobs directly when they have vacancies to fill. Every day, about 30 new remote jobs are posted on Indeed. So, be sure to check back often — you’ll never know what you may find. Hint: search for “remote” in the “where” box. The name says it all. We Work Remotely is a job board that focuses on sharing real remote jobs. This is one of my go-to job boards because it often includes listings from my favorite distributed workforces. Remotive can easily answer the where to find work from home jobs question. Not only is there a job board with frequently updated leads, but an active community of 25,000 remote workers you can join! Did I mention it’s free? Okay, so not all jobs listed on AngelList are remote. But it’s still work mentioning as a source of work from home job leads. After all, startups are often remote-friendly. And since AngelList is the place where the world meets startups, you can often find a number of remote jobs here. Find a variety of online, telecommute, and remote jobs over at Skip The Drive. Plus, they have an oh-so informative blog and a list of work from home resources. The entire is worth checking out for anyone who ever wonders where to find work from home jobs! Surprised to see LinkedIn on the list? Don’t be! This mega professional networking site can be a great source of remote jobs. To see as many telecommute (and freelance) positions here as possible, be sure to actively make connections with fellow out-of-the-cubicle thinkers. It also helps to enable the Open Candidates feature, which will bring remote recruiters directly to you! From writing and editing to marketing and customer service, there are plenty of remote jobs posted on Jobspresso. And if you frequent Twitter, be sure to give them a follow. You’ll receive at least one daily legitimate directly in your Twitter feed! Latest jobs are posted here almost daily. Many of the leads are tech-related. Design, UX, and developer positions can take over the job board. However, there is a category for non-tech remote ads. Power to Fly is on a mission to help women find better work-life balance. This means there are plenty of flexible, remote jobs listed on their job board. After you join, complete your profile and start applying! You’ll be notified whenever you’re a good match. If you ask these bloggers where to find work from home jobs, they’ll each have a unique answer for you! And that’s why I always recommend following work from home bloggers. Each of them listed here share real remote openings to their readers AND offer helpful blog posts that can help you realize your work from home goals sooner. Lisa searches the Internet daily to bring remote jobs to her followers. She also thoroughly researches and writes about remote companies, individuals jobs, and compiles helpful lists — must-reads for anyone thinking of working remotely! You can always count on The Work at Home Woman, AKA Holly Hanna, to share real ideas for earning an income from home. This includes everything from direct sales and home-based businesses to freelancing and solopreneurship. Fresh leads are added weekly along with a list of the most popular at-home jobs out there. Angie updates her remote jobs over at The Work at Home Wife at least once a week. Make sure you also stop by her blog to read real reviews and find actionable advice to create your own work from home job! Aside from a mega directory with more than 1,000 remote jobs, Anna of Real Ways to Earn Money Online, shares her hand-picked work from home jobs. Her blog is also a go-to source for new remote jobs! The Penny Hoarder is one of the largest (and most trusted) personal finance blogs out there. It also happens to be a great source of real remote jobs, too! Stop by frequently to read up on startups with remote positions to some of the most popular telecommuting positions out there. If you wonder where to find work from home jobs but are worried about scams or get-rich-quick schemes, you’ll feel right at home at Rat Race Rebellion. This blog has pre-screened job leads posted daily — and they’re guaranteed to be scam-free. 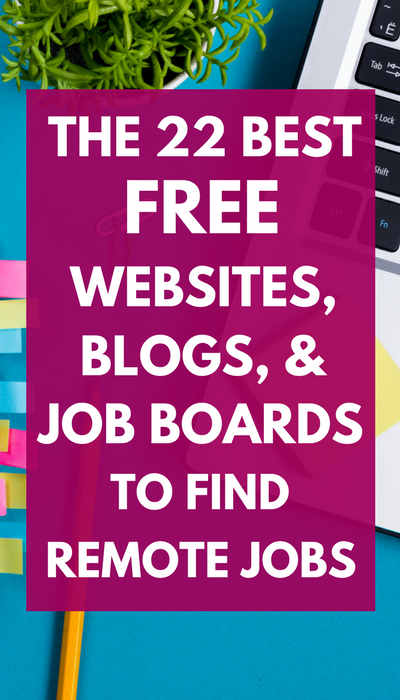 There you have it — 22 (and counting) free websites, job boards, and blogs that can answer all of your work from home questions! You’ll likely find you prefer a handful of sites. That’s okay! Whether you prefer browsing freelance gigs or want to work for a distributed startup, find the site that works best for you. And stick with it! You won’t find a work from home job overnight. Give yourself a realistic goal and do something every single day to work towards it. And, because I want to give you the best chance of success as possible, I’ve also put together a list of 141 distributed workforces. Grab your free copy by signing up below! P.S. This post may contain affiliate links. What are they? Read my disclosure statement to learn more. The post Where To Find Work From Home Jobs: 22 of the Best Free Sites, Job Boards, and Blogs appeared first on Work From Home Happiness.